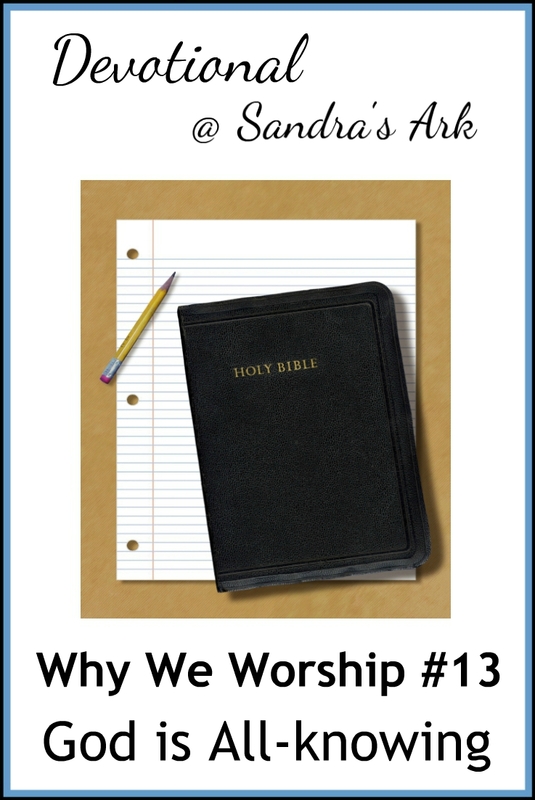 I am taking time each week to ask myself "Why we worship"
This includes the past, the present, and the future, and everything within these times. It includes what has actually happened and will actually happen but it also includes what could have happened and what could happen in the future depending on how we exercise our free will. So he knows what will happen and he knows what "could" happen. There was never a time when God did not know everything and there never will be a time when God does not know everything. Does this not give us a great security because we have a God who knows all things about us, about everyone else and about the universe. Read through 1 John chapter 3 yourself to get the right context for this verse. He is writing to people who are saved but perhaps have not had enough time or opportunity to have learnt many things about their heavenly Father. Throughout the chapter he is assuring them that they are in God's family and are loved by himself and God. Nowhere is he trying to scare them with the thought that God knows all things and will hold anything against them. He is in fact stating that God knows all things so even when they do not think they are good enough God knows their salvation and the truth they are standing on. How could He not be the rock for us to hold on to. Remembering the attributes of God is so comforting. Sometimes I am busy thanking Him and forget to praise Him for who He is. This post is a good reminder. He knows the end before the beginning and everything inbetween! Indeed, thanks for dropping by again. Hi Sandra! I am coming over from Still Saturday. I remember reading a saying: "I don't fear tomorrow because God is already there." I think that is a perfect illustration of his omnipresence and omniscience too. 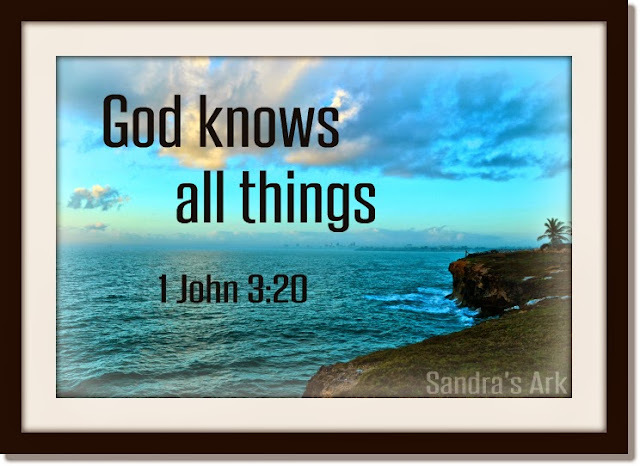 He knows all and is in all. It's often too much for my brain to take in...but I love to know that he is always with me. Right beside you at still saturday! Thankful for our All Knowing God! Mind boggling, isn't it? I love thinking of this in connection with His sovereignty. When I get discouraged over ... say what I perceive as my parenting mistakes and wonder why He entrusted us with the gift of adoption... I remember He knew us, He knew the future, and He knew we all needed to be together for some reason we can't begin to fathom. It's a great comfort to me. YES! HE is my Rock and I'm a "rocky" person. Partly, b/c I always look at my yard rocks and think of Him and His presence. And I'm a constant worshiper. He is truly my ROCK! A great reminder! He knows our past, present, and future! All our moves before we even make them. I am so glad that e is all knowing because no matter what we do, He is with us. I found you through the Sunday Community Linkup. thanks for dropping in Kalley, It is awesome to think about isn't it. Lately I have been thinking I worship not only because of who He is but because of how it really blesses me and makes me happy. Other times in the past it has been because He brings me comfort and helps me see beyond my sad state. He is worthy of worship! Hi Linda, glad you dropped in. 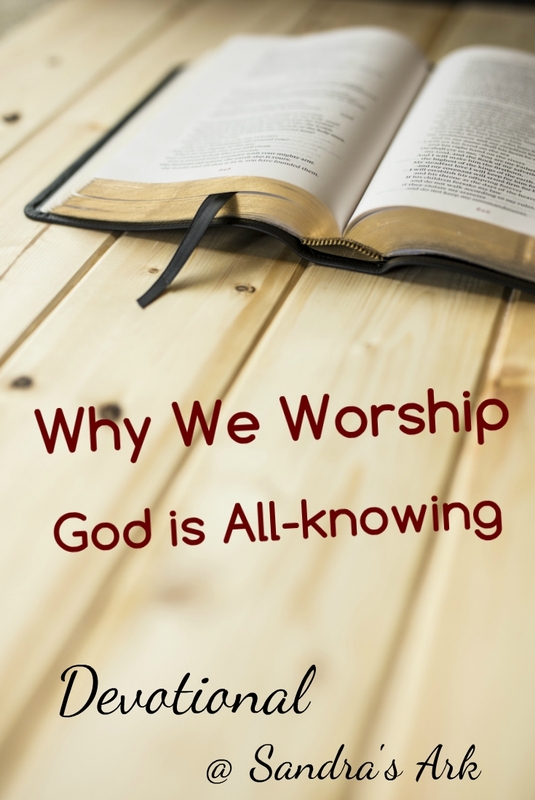 I love the way we can worship Him for different reasons but ultimately we are just meant to worship. "This includes the past, the present, and the future, and everything within these times." Yes, even those itty bitty times in between! What a beautiful reminder! I love that you linked up to #InspireMeMonday! Blessings! I love it that God knows everything. Sometimes it keeps me on the straight and narrow. Other times it comforts me that God already has a plan for whatever mess I've gotten myself into. That he knows me better than I know myself makes me feel loved. He is a great and wonderful God. Thanks so much for sharing! Hi Myra, lovely to meet you and thanks for dropping in to encourage me.